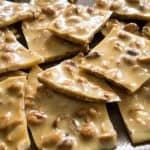 No need for complicated recipes or candy thermometers to make this delicious Microwave Peanut Brittle. With only ten minutes of prep time, you can have this candy perfect for gifting ready in just an hour! Prepare a baking sheet with a silicone mat or non stick spray. Set aside. In a medium microwave-safe bowl (with a lid) combine sugar, peanuts, corn syrup, and salt. Mix well. Cover and microwave for 2 minutes and 30 seconds. Remove the bowl and stir quickly. Cover and microwave an additional 2 minutes and 45 seconds. Remove bowl and stir in margarine and vanilla extract. Cover and microwave for 1 minute and 45 seconds. Remove bowl and stir in baking soda. Quickly mix, then spread onto the prepared baking sheet. Use to forks to spread the brittle into an even layer on the pan. Allow to cool 45 minutes before breaking into pieces. Prepare ALL ingredients ahead of time, you need to move quickly when making this and will not have time for measuring. This recipe is for a 1200 watt microwave. If your microwave wattage is different you will have to adjust the cooking times accordingly or risk burning your brittle. You MUST cover the bowl in the microwave or you will burn the brittle. No exceptions. If you do not have a glass bowl with a lid you can cover the bowl with a plate.